Better Late Than Never! A Look at 2014. It has been way to long since I made a blog post. Not because I have forgotten about all of you but because this time of year is always fairly hectic for me and blogging and fun stuff often takes a back seat. Every farm has different preparation methods for year end but regardless of your approach or farm size it takes considerable time and effort. This year a late harvest (paired with a bit of burn out and procrastination) has found me working overtime in Nov/Dec to catch up. My hubby counts on me to have our books up to date to help with things like grain and equipment inventories, monthly cash flow, cash requirements (especially at year end), and we use these numbers when considering what to purchase, what to trade, even our crop plan in the upcoming year. In order to have a successful operation someone should be spending a good portion of time in the office, and I am happy to do what I can to help in that area. With all of this hanging over my head I have neglected to take some time to blog about our 2014 harvest! I will try not to bore you with too many details but here is a quick overview of what happened on our operation this year. The 2014 harvest was a challenging one. Every season comes with its own hurdles but for us this one seemed to have a few extra. It started in the spring with a cool wet beginning to the growing season which put our crops behind. 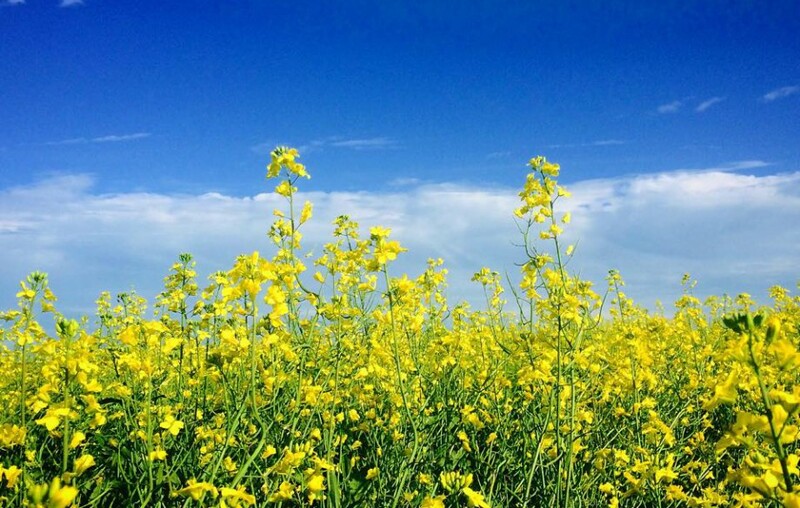 Excess rain stressed the crops and put them at risk for disease. This carried through to the fall and gave us a late start to harvest. We had some equipment changes on our operation which left us with an extra swather (aka windrower) and using one less combine than the year before. This situation would have worked just fine if the weather would have cooperated but periodic rain and snow throughout the fall ended up causing us many issues. As winter threatened, tensions rose and the importance of equipment performance rose along with them. Breakdowns can’t be completely avoided but some days it is considerably less convenient than others if they do happen. At one point, within 20 minutes of starting up, we had 2 combines down and one combine stuck (none of it was my fault!) Because we were trying to beat the rain in the forecast, that day seemed to be a little higher up on the anxiety scale. Luckily we had some great help this year and, as always, are thankful for those who work tirelessly beside us. After many long stressful days (and nights) we made it through, as we do every year, with a few more lessons learned. 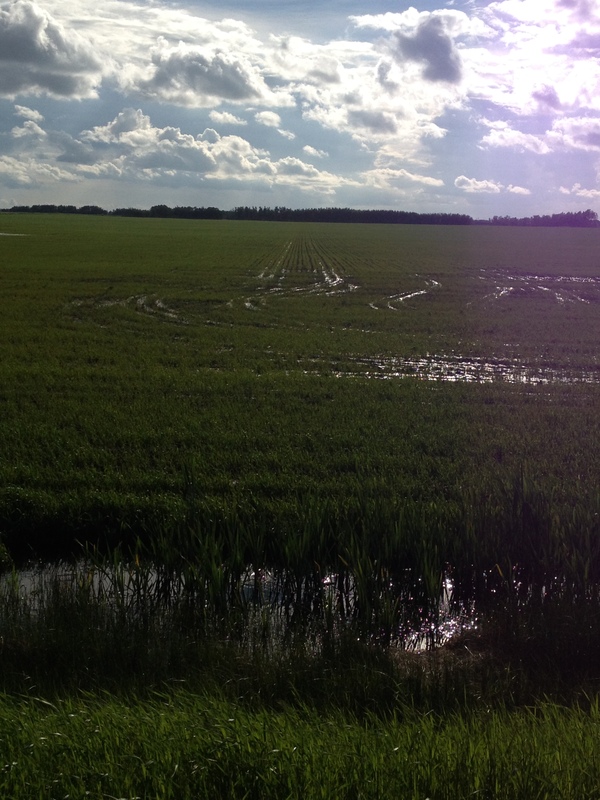 When crops are just starting out they like moisture, but not this much! 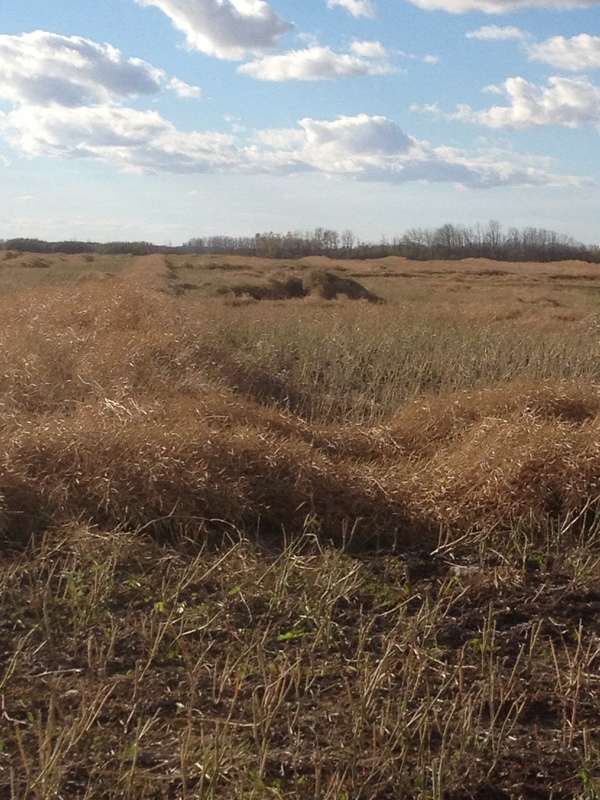 Many farmers around our area had yield losses due to ‘drown out acres’ this year. 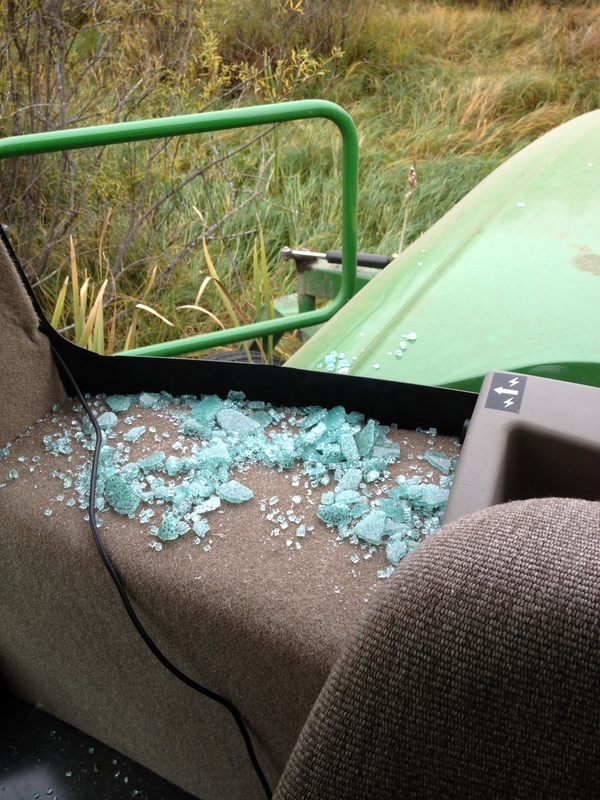 We had the strange misfortune of breaking 3 windows, at 3 different times, in equipment very early on in the season. This one was my job to clean up.